Foxy Locks Hair Boutique, Upper Gladstone Street Clonmel, is leading the way comes to helping you feel and look great! Thinning hair and hair loss can be a traumatic experience, for both men and women, whether its alopecia, hormone or age related. But, at Foxy Locks, there is an amazing new service to help you to get your confidence back! There, you can have a bespoke hairpiece created for you to blend with your own hair and transform your hair into the crowning glory you’ve longed for !! 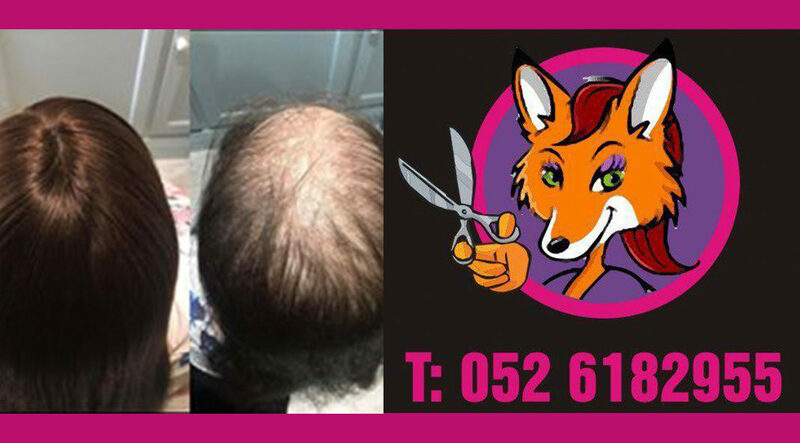 The T-parting service offered at Foxy Locks is a revolutionary new service that can help people with thinning hair ,alopecia and alopecia-related bald patches. The T-parting can be attached for up to 6 weeks and then reapplied! Once attached, the hair can be washed , dried and styled at home without removal. Alternatively, the T-parting can be styled as a clip-in piece that can be popped on and off with ease at home! The T-parting comes in a range of colours, sizes, lengths and is made from 100% human hair, which blends perfectly with your own hair. Foxy Locks are HSE approved, so medical card holders can a receive a €500 grant (this amount applies in County Tipperary, but may differ in other counties). This will cover the majority of the cost. However, an extra €50 may be required in some cases. To apply, simply obtain a letter from your doctor stating you have alopecia and Mary Teresa and the staff at Foxy Locks will do the rest! Private health insurance may cover costs depending on your plan. Pop in for a no-obligation consultation in their private room at the salon. Contact 0526182955 or find them on Facebook @foxy locks hair boutique clonmel.